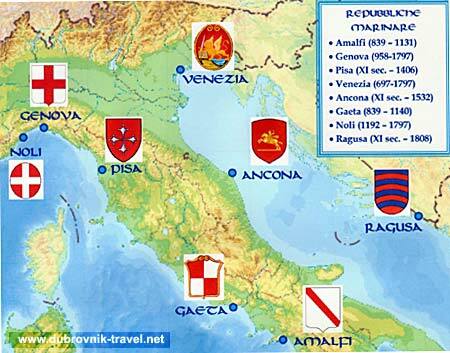 In 1358, following a war with the Kingdom of Hungary-Croatia, Venice was forced to give up, with the treaty of Zadar a large part of its possessions in Dalmatia. Dubrovnik was now free of Venetian rule, though not of its sanctions. In 1362, Venice forbade its boats from taking goods from anywhere in Dalmatia for export outside the Adriatic. Although this harmed trade in Dubrovnik and the other Dalmatian coastal cities, it stimulated the construction of larger boats that could sail beyond the Adriatic and into the Mediterranean. As a result, Dubrovnik ships were now able to reach the Levant and Egypt. They confirmed the security of its trade with a deal with the Ottoman sultan Murat in 1365 in Brusi. In 1367, the Venetians forbade Dubrovnik from trading in Venice itself. Dubrovnik responded with equal measures. At this point, aside from the city itself, Dubrovnik controlled the surrounding islands like Šipan, Mrkan, the island of Lastovo from 1272, Ston and its surroundings. the island of Mljet and the Peljesac Peninsula, which had been a gift from the Serb Emperor and Bosnian governor Stephen Kotromanic in 1333. Map of Dubrovnik territory and its surroundings. The Korčula channel marked the maritime boundary between the Venetian empire and the Republic of Dubrovnik . Ragusa voluntarily gave itself up as a vassal to the Kingdom of Hungary from which obtained the right to self-government in exchange for the constraint of help with its fleet and payment of an annual tribute. Ragusa was fortified and equipped with two ports. The Communitas Ragusina began to be called itself Respublica Ragusina from 1403. Although the city thereafter acknowledged the authority of the Croatian-Hungarian kings and paid them tribute, it was largely left alone to do what it did best – make money and even start to expand. Dubrovnik’s prosperity meant that it could flex its muscles and start taking territory from its neighbours. In the 15th century, taking advantage of the Magyar King’s weaknesses, Dubrovnik took over the southern Dalmatian islands of Brač, Hvar and Korčula in 1413. This brought it into direct contact with the territories of Venice, who was cementing its reputation as il Dominante on the Adriatic.